“UFC 136: Edgar vs. Maynard III” is the most talent-rich fight card of 2011. Did somebody say RICH? Well, the Gambling Gods have just released the complete betting odds for Saturday’s highly-anticipated show. 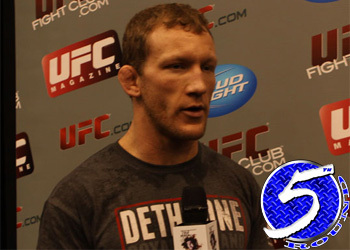 Lightweight champion Frankie Edgar will defend his throne against Gray Maynard (Pictured) in the night’s featured attraction. “The Answer” is a slight -140 favorite to finally avenge his August 2008 loss to Maynard, while “The Bully” checks in as a +110 underdog. The 155-pounders fought to a controversial draw in their rematch at UFC 125 this past New Year’s day. UFC 136 takes place this weekend inside the Toyota Center in Houston, Texas.